If you want to think about political subjects like the War on Terror or social “justice”, watch The Dark Knight or The Incredibles. If you want to ponder lofty philosophical themes like justice and identity, watch Batman Begins. If you want to contemplate Free Will and what constitutes a hero, then watch either of the Hellboy movies. If you just want to turn your mind off and amuse your senses for two and a half hours, The Avengers perfectly accommodates that desire. This movie, which is the result of four years of mostly poor buildup, is probably the best “popcorn movie” to come along since Avatar or Star Trek back in 2009. If you haven’t seen it yet, you should catch a showing soon because this is a movie that ought to be experienced on the big screen. The Avengers opens with the trickster god of Norse mythology, Loki, breaking into a S.H.I.E.L.D. base and stealing a powerful cube called the Tessaract. Don’t ask me how he recovered from that fall he took in Thor; such an inquiry is beyond my ability to explain. Anyway, Loki is back, he’s used his staff to enslave the master marksman Hawkeye (who is briefly shown in Thor, for no other reason than to get him in this movie), and he plans to open a portal to another galaxy, an action which would unleash an alien army upon the denizens of Earth. The fate of the universe is at stake, and a group of extraordinary people is needed to save our planet from an unprecedented threat. 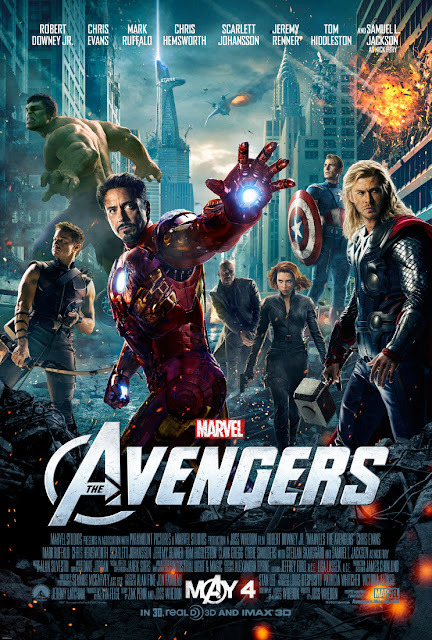 Nick Fury, the head of S.H.I.E.L.D, dispatches several agents to assemble his superhero dream team, The Avengers, an organization which includes Iron Man, The Hulk, Captain America, Black Widow, Hawkeye, and Thor, although he hails from another universe entirely and wasn’t originally on the list. The movie kind of spins the situation of Aesop’s old fable about the bundle of twigs - individually our heroes are strong, but united they are weak. They’re accustomed to battling evil on their own but are strangers to the concept of cooperation and teamwork. Before they confront Loki and his army in a magnificent Manhattan-set battle, The Avengers must conquer their pride and learn to fuse their powers in order to more effectively combat the evil which threatens mankind’s freedom. The movie’s brimming with witty dialogue. Prior to seeing the film, I was scared that all the best lines would be in the trailers, but I fortunately was proven wrong. I was able to muster a laugh at least a half-dozen times during this non-comedy, and there were enough moments of slapstick to have the younger kids in the audience laughing continuously (the movie was effectively muffled for about 30 seconds after one particularly hysterical pummeling by the Hulk). The special effects are akin to the CGI creations of the Transformers films; those coming to see this can expect a plethora of detailed explosions, collapsing buildings, futuristic weaponry, and nasty aliens. The animation and representation of the Hulk is a vast improvement over that in the 2008 origins movie. In the Edward Norton movie, the Hulk was a simple, digital creation who ended up looking cheesy because he was assembled entirely on a computer. In The Avengers, however, the special effects team used motion capture (the technology exploited in LOTR, King Kong, and Avatar) to design the Hulk, with the end result of making the conflicted hero much more intimidating and lifelike. The first Hulk was a laughable cartoon, but the new Hulk is a monster who could scare the heck out of some kids. The Iron Man effects are great as usual, and some of the film’s best scenes are those which show him flying through city streets, evading alien vehicles and causing a lot of destruction in the process. To sum up, watching The Avengers on the big screen is a Marvelous way to spend a couple hours and temporarily divert your mind from the Supreme Court train-wreck and the precipice on which our country’s freedom totters. You won’t leave the theater a wiser man, and you certainly won’t leave a richer man (if you caught an Imax 3D showing, you could leave a $20 poorer man), but you’ll probably leave a happier man. I now take a break from writing The Author’s Files to buy some Lego Avengers sets I’ll eventually resell for a profit to the movie’s legions of fans. Think of it as Craigslist stock-trading, only less risky and requiring more patience. Brave – It’s from Pixar, so it’s probably terrible. It appears to be pro-abortion, feminazi indoctrination for the little kids, but maybe I’m overthinking things. At the very least, it encourages young viewers to disrespect their oppressive, out-of-touch elders. The Dictator – Politically incorrect jokes about middle-eastern dictators = awesome. Politically incorrect jokes about 9/11 = heinous. The Dark Knight Rises – “There’s a storm coming, Mr. Wayne… you and your friends better batten down the hatches, ‘cause when it hits, you’re all going to wonder how you ever thought you could live so large and leave so little for the rest of us.” Christopher Nolan has a lot of gall to depict the liberal Occupiers as the villains… I can’t wait for this. The Amazing Spiderman – “You found my weakness: small knives!! !” Pew pew pew. Peter Parker… what a fine, humble role model for boys. The trailer tells me his story has never been told… since Spiderman 3, 5 years ago.